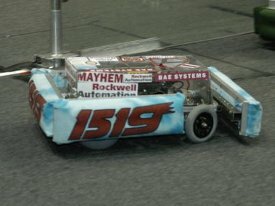 The 2008 challenge, FIRST® Overdrive (2008 FRC® Game Animation), elicted an interesting and unique game strategy. The field was divided into left and right sections by a metal overpass 6.5 feet off of the ground. A 6 foot lane divider cut perpendicularly down the middle of the field. Underneath the over pass and on either side of the lane divider were two color-coordinated finish lines. In the preprogrammed autonomous period, robots could gain bonus points by either knocking balls off of the overpass or driving around the central obstacle. 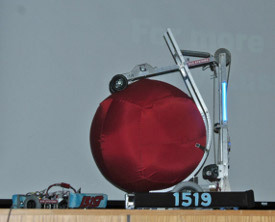 During the driver-operated match, a robot attempted to drive laps around the field either carrying or herding a 40 inch inflatable ball. When they passed the finish line, they could either carry or push the ball underneath the overpass achieving a 2 point goal, or lob it over the overpass achieving an 8 point goal. Finally, in the end game, robots could attain 12 bonus points for placing the enormous balls back onto the overpass. For this year’s challenge, we rapidly concluded that a hurdler would be required to attain the highest scores, but we continued to be drawn to the challenge to make a very fast robot as well.Eventually we formed two subteams, with the seniors leading a team to create a hurdler and several of the younger students working on a fast racer. The hurdler team originally decided on an elevator design, but at the end of week 3, when we saw the video of the Rhode Warriors hurdling with a design very similar to one of our previous concepts, we decided to build that. The new design came to be known as Fezzik. Meanwhile the racer subteam had evolved a small, carefully optimized design. Making a very fast robot is easy, but making one that can be precisely controlled at high speed is not. We used Ackerman steering (like a car) in front, and rear wheel drive with software differential for better cornering. The center of gravity was kept very low and off center since we would be turning left far more than right. The design was dubbed SpeedRacer, Mach 6. During practice we shot some video of SpeedRacer doing laps, and we posted it on our website. Word apparently got around, eventually taking our website to #5 on FIRST Topsite. we concluded that it should be possible to create two very different configurations of a single robot, as long as all elements of both configurations met all of the applicable rules, particularly including the weight limit. It took a lot of work (and rework) but by the time we arrived at GSR, we had reached this goal. We had discussed our plans in advance with several key people from GSR, but when we arrived at the event we learned that the GDC had ruled that if configurations looked like two robots, they were two robots, and only one would be allowed to compete. We were quite disappointed. SpeedRacer took to the floor for a couple of practice day matches, but we elected to compete with Fezzik. It became apparent in the practice rounds that the compromises we made to meet the combined weight negatively affected SpeedRacer’s structural integrity (the front bumper kept remaining on the field!) and Fezzik’s handling (staying upright is a good thing…). Since they were now declared to be separate robots by the GDC, we did not continue the difficult engineering required to stay under a combined weight. We added weight to Fezzik to make it more stable and eventually replaced the front of SpeedRacer with steel. Fezzik performed admirably. We finished qualifications at 8-2 and ranked 4th place. 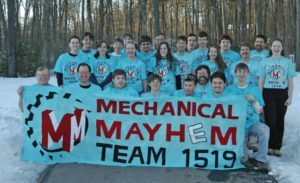 During the alliance selection process we were invited to join Team 1058, but respectfully declined their invitation so that we could choose team 126, Gael Force. For our second pick, we selected team 1307 (Saint Thomas Aquinas Robotics) as our third alliance member. Our alliance won the first two quarter-finals by more than 20 points, but the semis were a major challenge. We definitely met our match in the #1 seeded alliance of 121, 40, and 134. The first round ended in a tie, forcing us to replay the match. We lost the replay, but it certainly was an exciting one! The third match went to our alliance, but only because 121’s robot had tipped over partway through the match. Then in the fourth and final match, we lost. Those matches were amazing. As a member from team 121 put it, “FOUR ROUND SEMI-FINALS!!! 4 rounds in a semi-final is unheard of and by far those were the most 4 exciting matches I have ever been apart of in FIRST, so thank you guys for being such great competition.” Their alliance went on to win handily. We did not go to any other regionals or the Championship, but the robots were too much fun to stop competing. The MAYHEM could not stop now! In 2008 we attended 7 post-season events, our most ever. We competed with Fezzik at BattleCry @ WPI but brought along SpeedRacer also. When a few of the teams didn’t show up on Friday night, we were able to compete with SpeedRacer as a stand in until they arrived on Saturday. Fezzik did very well. He placed us in the finals allied with 126 and 1027 and playing against 121, 40 and 1474, where we were defeated after a tie and two losses. This was ironically similar to the semifinals at GSR with four of the same teams and the same outcome. In addition, we received the Purple Heart award, which credited the lengthy periods of time spent in the pits, diligently working on our robot to prepare it for competition. points in the third match! We were able to record one of the racer’s matches in which it scored 8 lines in hybrid and 13 laps in teleop. Fezzik also competed with vigor in the hands of brand new drivers, and was invited into the playoffs by the #7 seeded alliance. For Mayhem In Merrimack we brought two robots, like we have the past two years. This year having two robots was a natural, as both Fezzik and Speedracer were ready to roll. As in past years, Mayhem in Merrimack was competed in a two-on-two alliance format, offering less ball contention for Fezzik and fewer obstacles for SpeedRacer. Both robots did well; SpeedRacer came in #1 seed and Fezzik came in #3. Fezzik teamed with Team 40’s second robot (a replica of their primary ‘bot) to win handily, defeating SpeedRacer teamed with Team 1073 in the final match. As an added treat we got to talk with FIRST celebrities Andy Baker and Mark Koors from AndyMark who took the time to volunteer as Referee and Scorer respectively, and to take in the display of New England FIRST team talent up close! Thanks for coming! Shortly after Beantown Blitz we received and accepted an invitation to attend the Indiana Robotics Invitational on July 18 and 19. What an adventure…Three families, a couple of additional students, and two robots made it to Indianapolis. The robots survived the trip in the borrowed snowmobile trailer, dirty but intact. Friday got off to an amazing start. In our first match we were allied with the BeachBots (330) and FoleyFreeze (910), and with this alliance we managed to win against the amazing Simbotics (1114). The win sure got us psyched! By Friday night we were 4-1 and ranked in the top ten. Saturday morning we won our sixth match, pushing us to fifth in the standings. We then unfortunately lost our final two matches which dropped us to 16th seed and we were not chosen in the alliance selection. 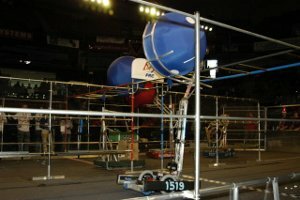 In the final event of 2008, River Rage, we were again allowed to compete with both robots. Both competed well in a strong field. SpeedRacer ended up leading the #2 alliance, and Fezzik (with less experienced drivers) led the #6 alliance. Both alliances were defeated near the end of the elimination matches.